The 10th release of a label is always a big milestone – a reason to celebrate and a moment to review the events that took place in the past. In this sense CONTUSE presents a collection of exclusive material an the most important pieces from the label artists. Between the tracks of Dapayk solo and DJ 3000 – obviously the protagonists in the first decade – you will find Marcel Knopf, Distale also known as Michael Knop and the freshman Alexander Franz. 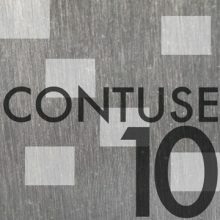 The sound of CONTUSE is pure and functional techno connecting the metropoles of Detroit and Berlin. For some it’s just oldschool, but for others it’s traditional production techniques in a preserving and refreshing spirit. We stick to this idea as long as people keep on dancing.